MANILA -- The Philippine Drugs Enforcement Agency (PDEA) on Friday said an estimated PHP6.8 billion worth shabu might be circulating on the streets now after the agency seized four empty magnetic lifters from a warehouse in Cavite. 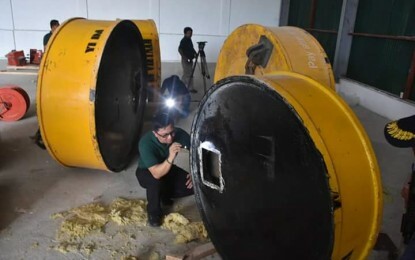 PDEA Director General Aaron Aquino said the magnetic lifters are similar to the seized magnetic lifters, which contained around 500 kilos of illegal drugs, at the Manila International Container Port (MICP) in Manila last Tuesday. However, Aquino said upon the inspection of the PDEA and PNP last Wednesday, the magnetic lifters in Cavite were already empty. “To be sure, PDEA NCR (National Capital Region) operatives deployed K9 on Thursday afternoon to check whether the lifters were used to transport illegal drugs. The K9 dogs positively detected traces of illegal,” Aquino said of the containers authorities confiscated from a warehouse in CRS Subdivision, Barangay F. Reyes, General Mariano Alvarez, Cavite. “This only proves that these magnetic lifters were used to bring in illegal drugs inside our country. PDEA and PNP (Philippine National Police) believe that this is part of the shipment intercepted last Tuesday in MICT,” he added. Aquino said PDEA estimated that these four magnetic lifters contained approximately 1,000 kilos or a ton of shabu with an estimated value of PHP6.8 billion. “This is very saddening PHP6.8 billion worth of illegal drug are now circulating anew in our streets,” he noted. Initial information revealed that the illegal drugs came from Taiwan, Republic of China and the syndicate only used Malaysia as transshipment point, Aquino said. He also believed that the Golden Triangle Syndicate is behind the shipment. Golden Triangle is notoriously known as the world’s foremost drug-producing region - in the borders of Thailand, Laos and Myanmar. Aquino said law enforcers are continuously conducting backtracking investigation to determine the personalities involved in the operation. “Initially, we have at least 19 persons of interest including 11 Chinese nationals. We cannot reveal their names yet because of our continuous operations,” Aquino said adding the PDEA also obtained several documents, including various documents, checks, shipping documents and CCTV footage.